Can you eliminate heartburn using home remedies? This question occupies tens of millions of heartburn sufferers worldwide who have been let down by the conventional medicine approach. Since the vast majority of medications used to treat heartburn produce short-term results accompanied by a myriad of side effects, there is a growing demand for safer, more effective long-term and accessible alternatives. Fortunately, there are home remedies that can yield immediate results for most heartburn sufferers when correctly chosen and implemented. Heartburn is a painful burning sensation in the chest and/or throat that usually occurs during or after a meal. Persistent heartburn experienced twice a week or more often indicates the occurrence of gastro-esophageal reflux disease (GERD), also known as acid reflux. Gastro-esophageal reflux disease occurs when the lower esophageal sphincter (the muscle connecting the esophagus with the stomach) becomes relaxed and allows gastric acids to leak ("reflux") back from the stomach into the esophagus. As the acids come in contact with the epithelial cells of the esophagus, they cause the painful sensation referred to as heartburn. Except for heartburn, acid reflux can manifest as numerous other symptoms, such as brackish taste sensation, dry cough, chest pain, nausea, persistent hoarseness and asthma attacks at nights. Over time, daily acid reflux damages the cell lining of the lower esophagus and can evolve into a precancerous condition called Barrett's esophagus . This is one of the reasons why treating GERD in a timely manner is of a great importance. Poor dietary choices and the consumption of large meals that contribute to improper digestion and the accumulation of toxins and acids in the stomach (toxic overload can suppress the immune system and sluggish digestion can encourage Candida overgrowth. these can all aggravate your existing acid reflux condition). Among obese individuals the pressure on the abdomen increases thus more acid is splashed up into the esophagus. Stress and inadequate sleep also weaken the immune system. Consuming 2 teaspoons of raw, pure, unheated and unprocessed honey after a meal. This type of honey has proven antibacterial, antioxidant, antiviral and antibiotic properties; therefore it can relieve the inflammation in the esophagus. Taking 1 tablespoon of organic apple cider vinegar once a day on an empty stomach. ACV is a powerful antiseptic and antibiotic food, so it acts as an effective intestinal cleanser and can also help restore the proper acid alkaline balance of the intestines (extra acidity in the blood and the intestines often leads to the aggravation of acid reflux). Elevating the head of your bed six to eight inches . This practice can help keep gastric acids in the stomach. Note that using extra pillows is often not enough to elevate the esophageal area to prevent acid contact. On the contrary, putting blocks of wood under the bedposts, or using special foam wedges, sold in bedding stores can do the work. Bear in mind that while the above home remedies can produce almost immediate relief, they are not heartburn cures per se. 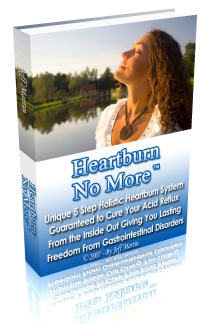 The only way to eradicate your acid reflux condition permanently is by choosing a comprehensive all natural holistic treatment that naturalizes the underlying factors responsible for GERD. Can Eating a Lot of Fiber Cause Heartburn?